My mother bought her first GPS in the 1990s. A few months later, she came home angry because it had directed her to the wrong side of the city, making her an hour late. “That’s too bad,” I said, and we went on with our lives. We both understood that commercial GPS was a new technology and wasn’t infallible, but one wasted hour was a small price to pay for the 99 percent of driving trips on which it worked correctly. We knew that with further testing and user feedback, GPS technology would continue to improve. Things would have been different if that technology with a 1 percent failure rate was a pacemaker or artificial valve implanted in my mom’s heart and designed to keep her alive. But how can we expect technology to improve if a person’s health is at stake? It is unethical to test new medical devices on patients without ample evidence they will work; extensive animal testing, clinical trials and a complicated FDA approval process are necessary before such devices go to market. This means potentially lifesaving treatments can take years to reach patients. Now, scientists are turning to new tools, including computer simulation and 3D printing, to develop faster, safer ways to test medical devices without installing them in live humans or animals. My lab is working on applying these techniques to heart and vascular diseases. This work has the potential to improve outcomes from the invasive procedures common in treatment today. Vascular disease, my research area, is a very common affliction in the U.S. There are hundreds of techniques for fixing circulatory system problems, including stents (wire cylinders hold blood vessels open), balloon angioplasty (blocked arteries are reopened by pushing obstructions out of the way) and even heart valve replacement. Before a cardiovascular device or procedure is deemed safe and effective, it must be verified to successfully restore healthy blood flow in the body. It has been shown that the details of blood flow, such as flow speed, direction and pressure, can affect the health of the cells lining the heart and blood vessels. Knowing what the blood flow looks like before being fixed, and what may happen after a procedure or device installation, can help predict the technique’s success. Properties such as flow speed, direction and pressure are hard to measure in a live human or animal because most measurement techniques require puncturing blood vessels. The few noninvasive methods either give unreliable results or are too slow and expensive to use on every patient. Furthermore, most flow measurements from live animals and humans are not sufficiently detailed to determine whether a procedure will ultimately lead to disease of the walls of the affected blood vessels. To circumvent this problem, scientists can test cardiovascular devices and procedures using simulations and synthetic models. These studies allow far more controlled and extensive flow data collection than would be possible on a live patient. 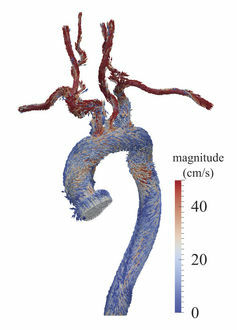 Several research groups, including my own, are currently doing this sort of work, which includes modeling fluid velocity and pressure in blood vessels with computers. This process is called computational fluid dynamics (CFD). Because every patient’s vascular network is a slightly different shape, there has been a movement to perform patient-specific simulations. That means scanning an individual patient’s blood vessels from medical images and modeling them virtually. By varying the model to simulate a procedure or device implantation, doctors can predict how the patient’s blood flow will change and choose the best possible outcome in advance. 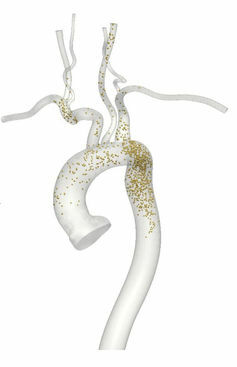 For example, CFD has been used to model coronary aneurysms in children and suggest techniques for treating them. There are many advantages to using this method to predict cardiovascular procedure and device success. First, CFD produces detailed data on blood flow near vessel walls, which are difficult to measure experimentally and yet are critical in determining future vessel health. Also, because CFD can simulate variations in blood vessel shape, physicians can use it to optimize surgery plans without experimenting on the patient. For example, CFD has been used to plan surgery to repair the hearts of babies born with only one working ventricle. CFD can also show how blood flow distributes medication to various organs and tissues: tracking the motion of medication particles injected into a vessel reveals where they reach blood vessel walls. However, CFD also has its challenges. Cardiovascular devices are more difficult than surgery to model in a simulation. Also, fluid models often must be coupled to models of arterial wall mechanics and biological factors such as cell responses to hormones to obtain a complete simulation of a device or procedure’s impact. Some researchers, including my group, have taken modeling beyond computers and have fabricated physical models to study how cardiovascular devices affect blood flow. Now 3D printing technology is advanced enough to build realistic models of human blood vessels, and pulsatile-flow pumps can drive flow through these vessels to mimic the heart’s pumping. Since the vessel models are synthetic, there are no ethical issues associated with puncturing them to take flow measurements. These real-world models also have the advantage that it is possible to install real cardiovascular devices and use real blood, neither of which can be accomplished with a simulation. For example, a recent study found previously unidentified vortices in blood flow through a curved artery downstream of a stent. However, experiments are slower than CFD, more expensive and generally produce lower-resolution data. There are still many challenges in using fluid mechanics simulations and experiments to predict the success of cardiovascular procedures and devices. The effect of flow on blood vessel health is closely coupled with the elasticity of blood vessel walls and cell responses to blood chemistry; it is difficult to model all of these factors together. It is also hard to validate model data against real human blood flow since it is so difficult to take measurements in a live patient. However, simulated blood flow models are already being used in the clinic. For example, the FDA recently approved HeartFlow FFR-CT, a flow simulation software package, to help health care professionals evaluate the severity of coronary artery blockages. As blood flow modeling techniques continue to develop, it is our hope that we can acquire more data on the human circulatory system and the effectiveness of devices with minimal human or animal experimentation.